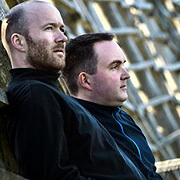 Pjusk, the Norwegian duo of Rune Sagevik and Jostein Dahl Gjelsvik, strives to avoid any contact with the typical. 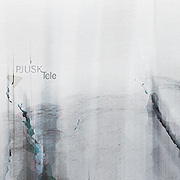 Their CD Tele (50'55") drifts the listener between actively engaging with this work's unique sound design and the dim inner realm of sleep. The nine tracks are presented across two sections. While the first sonic story is painted from a darker palette, the second still feels icy but somewhat brighter. Bestowing a solemn brittle coldness Tele maintains a complex kind of directness, as if straight out of a dream. Opening with several monstrous horn blasts, a marvelous unease is created and persists over the next few tracks. Null-time is created out of textural strangeness - the detailed sound collage flowing in multiple directions and speeds. The second half of Tele offers more in the way of rhythm, harmony and melody - all suppressed beneath a slowing arctic atmosphere. A lumbering tone pattern trudges along in machine precision below progressing clouds of chords. Ordered notes reiterate and feel constrained until the closing track. With its rolling metallic sequencer line and overlaid spacey guitar this piece nearly sings its boreal message. Pjusk's travels into the subconscious are no less imaginative, bizarre or groundbreaking than the frigid works of Irezumi, Biosphere or Aairria. With its cognitive distortion, small transformations, cold light and dark poetry Tele is best suited for those who feel safest in solitude. To some this album may seem like a minimal sonic environment. But for those who care to listen closely there is an abundance of interesting shapes, forms and transitions slowly rising, churning, expanding then falling away. Predictability somewhat dulls music's impact. With work this inventive it all feels new.